"This pathbreaking book is fascinating, frightening and essential reading. It demonstrates how much of what we treasure in our lives is unwittingly being surrendered as we fall into the spider web of social networks, a disaster in the making that requires a thoughtful but immediate legislative response." Available at Amazon.com, Barnes and Noble, BooksAMillion, IndieBound and through Apple iBooks. The 24-year-old Georgia high school teacher who was forced to resign after she posted a vacation photo of her drinking a beer at the Guinness factory on her Facebook page. The Pennsylvania school district where high school officials remotely activated the webcams on students’ laptops and snapped photos of them in their bedrooms. The badly-injured woman who brought a products liability lawsuit in New York and was told by the judge that, since she was smiling in her Facebook photos, she couldn’t be that badly hurt. How can you protect the privacy of your digital self? Lori’s book shows how people can fight back when what they post on social networks is used against them. She also ignites a battle for further protections, from a right to connect to a right to privacy, and proposes a Social Network Constitution to protect us all. The New York Times: "... there is still no legal bar to cloning people without their consent or knowledge - say, from hair follicles in their hairdresser's sweepings. Andrews has swallowed this kind of gnat repeatedly with other forms of reproductive technology and can hardly be gagging at it now; the law will never provide paradise on earth, but with help from people of Andrews's quality, it copes." 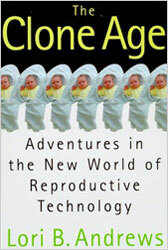 Judicature: "If reproductive technology is the Wild West of medicine ... then Andrews herself is surely Paladin, the hero of 'Have Gun, Will Travel.' Whether she is jetting off to Dubai to advise the government on cloning ... or brazening her way past the customs agent in Miami, straight off a flight from Columbia with a container of blood samples and sperm that 'absolutely cannot' be opened, Andrews is in the thick of the action. This account of her adventures is a quick read and an enthralling story that should engage and reward the neophyte and sophisticate alike." Frontlist: "In her pathbreaking book, Lori B. Andrews provides the first detailed glimpse into how genetic technologies can change our self-image, our relationships with loved ones, and our expectations about our children." American Scientist Online: "For those interested in a general overview of the impact of clinical genetic services and their policy implications, Future Perfect will prove very useful." America: "A professor of law at Chicago-Kent College of Law and an internationally recognized expert on biotechnologies, Andrews presents her case in eight well-structured chapters, with an extensive table of contents as a helpful guide." Association of American Physicians and Surgeons: "Andrews and Nelkin have elucidated the ethical dilemma so that the pendulum can swing again to a more appropriate position." 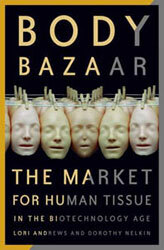 Washington Monthly: "In their highly informative Body Bazaar: The Market for Human Tissue In the Biotechnology Age, Lori Andrews and Dorothy Nelkin … draw on numerous examples of questionable medical ethics to illustrate their contention that biotechnology is spinning out of control." San Francisco Chronicle: "Andrews and Nelkin usually write for an academic audience, but Body Bazaar will appeal to laymen and academics alike. The writing is clear, and their stories have enough shock value to hold any reader's regard." Find out about Lori's mystery novels here.